← Grand Champion Fleece at Maryland Sheep and Wool Festival 2013! Hallelujah, or Hally as her new mommy calls her, is a pure Corrie (Saxon is her daddy). We had given up hope that her mom Gretchen was ever going to give birth–this was VERY late. She went into labor 10 minutes before my store opened. I kept one eye on her and one eye on my store. It became clear pretty quickly that this baby was stuck. Gretchen is a small yearling and singles are often large. So for about an hour the lamb was in this position, with the head and two front feet partially out. I took this picture because I thought it was so cute that little Hally’s tongue was sticking out the whole time. A vaginal shot of Hally. She was like this for over an hour. You are looking at a nose, tongue out to the side and two front hooves. Pretty original first baby picture, huh! So after an hour, with a very sympathetic customer in the store, I went ahead and started helping Gretchen. I pulled and Gretchen pushed in perfect cooperation. And with much tugging and straining out popped HALLELUJAH! Hally had already been promised to a loving mommy who wanted to raise a bottle-baby. She now has a special job as a therapy companion! Hopefully I can report more on this later. So after several days nursing on Gretchen to get the colostrum, she went to her new home. 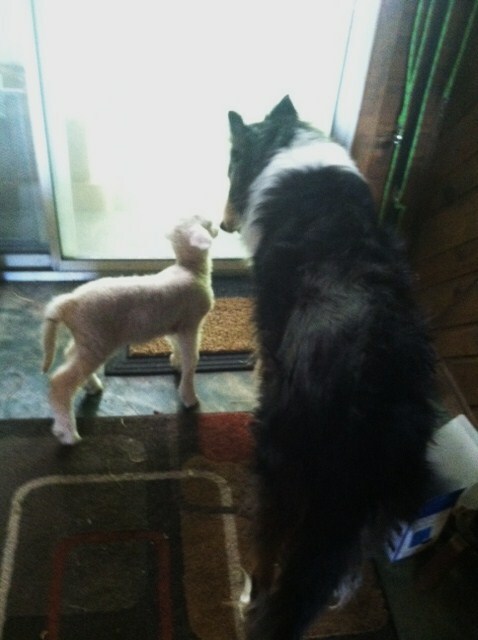 This entry was posted in lamb, Sheep and tagged bottle baby, Corriedale, Gretchen, Hallelujah. Bookmark the permalink. I’m so sorry for the loss of your calf. Keep that colostrum–good as gold! Thanks. 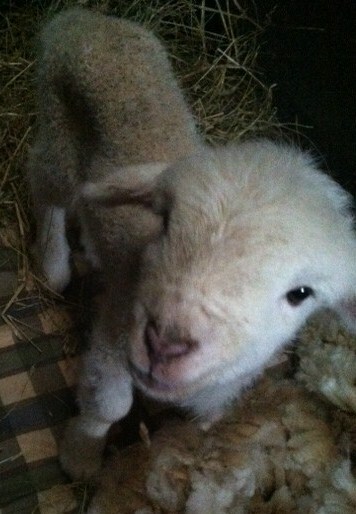 Hallelujah is the cutest lamb ever! Glad she made it! I give a thumbs up to Gretchen for going through all that hard work with the help of you!! !